My father died by car crash on Wednesday night, November 24,2004 while he was traveling from Jackson, Michigan to Ohio (USA). . I am constrained to contact you because of the maltreatment I'm receiving from my step mother.She planned to take away all my late father's treasury and properties from me since the unexpected death of my beloved Father.Meanwhile I wanted to escape to the Europe but she hide away my international passport and other valuable traveling documents. seeking asylum under the United Nations High Commission for the Refugee here in Dakar, Capital Republic of Senegal. 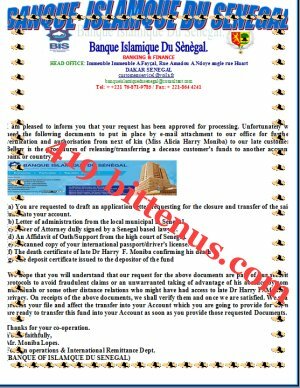 I wish to contact you personally for a long term business relationship and investment assistance in your Country.My father of blessed memory deposited the sum of US$5, 700, 000.00 in a Bank with my name as the next of kin. However, I shall forward you with the necessary documents on confirmation of your acceptance to assist me for the transfer and investment of the fund.As you will help me in an investment, and i will like to complete my studies, as i was in my 1st year in the university, when the crisis started. It is my intention to compensate you with 10% of the total money for your services and the balance shall be my investment capital. This is the reason why I decided to contact you. Please all communications should be through this email address only for confidential purposes.As soon as I receive your positive response showing your interest I will put things into action immediately. Good morning to you once again and thank you for your caring and concerns towards the releasement of this fund. I hope this e-mail finds you well and healthy. Greetings from me here. Having read through your e-mail now, I must first express my gratitude for your assurances to assist me on this project, I have stopped attending school for a long time now due to lack of finances and security purpose, therefore, it is my wish that on the completion of this transfer, I will through your advise and assistance complete my education once I come over to stay with you in your place while any investment I shall go into with you will be managed by you until I am able to join in you in the management of the investment on the completion of my education. It is also my wish that on the completion of this transfer, you will assist in bringing me over to your place so that I will be able to continue my education there because I am presently not safe here and I have the fear that my life is danger. These, among other reasons is why I have advised that you should not allow any person to know about this transaction or I may be running the risk of being killed here or attacked in your place or in your country when I will come over to stay with you upon the completion of this transfer. It is my wish that when I come over, I will live a quiet and comfortable life. 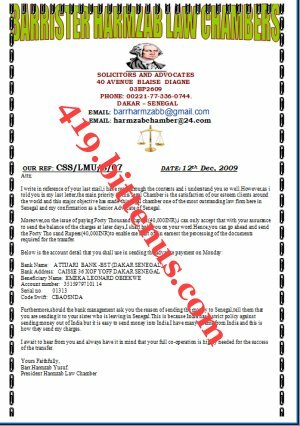 As I have told you in my earlier e-mail, this deposit was made by my late father when he was alive and he appointed me as the beneficiary and next of kin on this deposit considering that I am the only daughter because I lost my mother when I was 2 years old. To my father, I was like a princess, he showed me all his love, kindness and care because I was like everything to him hence, his decision to hand over all the details pertaining this deposit to me before his untimely death, so that I can use the money to take care of my life . 1) Firstly I have the Death Certificate of my late father and the deposit certificate of the money with me here.And I'll send them to you after you had contacted the lawyer for the other documents. Please keep this matter strictly confidential, I can always trust you, Because I don't want my step-mother and the camp authority to know about this on any account, as you can see that we are almost at the end of this transaction, God will help us. Please Dearest, I will like you to make contact with this law firm immediately and ask him to help us to get those needed document for us to enable you send them to the bank for the transfer of the money into your account , as you can see that everything concerning this transfer is almost complete, please help me out to see that this lawyer get this document within this week OK, my prayers are with you and I know that God will surely see us through. Send the letter you received from the bank to the lawyer for his more understanding. I will never forget you in my life, God bless you for me, waiting to hear from you with the response from the lawyer, please call the lawyer on the telephone so that he will know our seriousness OK at the same time send also an email to him. Once again,Thank you for your concerns, always put me in your daily prayers.And My good God Will Always bless you and your family for me. Good morning to you.I know as i write this mail, and i just want you to know that I'm here praying for you to succeed today and send the money to the lawyer so that he can get the required documents for the transfer.I'm praying and i believe that God will help you.My Dear ,i tried to take my meal but i lost appetite for meals,all my mind and thoughts are focus to when I'll hear the good news from you,then I'll know that my days of sorrow is subsequently coming to the end. My Dear ,I want you to know that you're my only love,my life, my dreams,this is what you mean to me.You have been the motivation behind every breath I take.My whole life ruled by thoughts of you- of us.The day that I met you was the day my life and thoughts on relationships changed forever.To fall in love with a man who I can just be myself with,who brings out a part of me that I always knew existed but could never find,is just the most amazing feeling I could ever have.The feelings and emotions that you are able to evoke from me are for you alone - a part of me that I want you to have, something that no one else in my life has ever received before. My Dear,I have so much to thank you for,so much more yet to give you,so many moments of my life yet to savor with you beside me.You are my love;to me,you ARE love.I love you,more than I could ever impart to you with words.I'm here in the Rev.Father's office till evening when I'll check my inbox again to see if you have sent a mail to me,then i'll write another for you before returning to the camp.May God continue to guide and protect in where ever you're for me.I send my hugs and many kissessssssss to you.